The housebuilders’ costs have increased by 27 per cent in the last five years in the UK owing to rise in materials and labour cost. 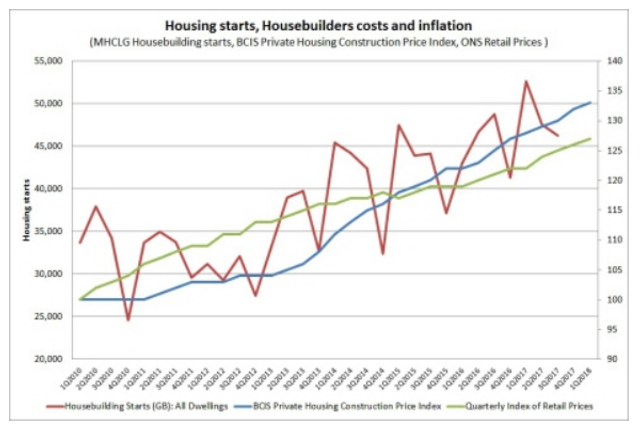 According to the latest BCIS Private Housing Construction Price Index (PHCPI), housebuilders’ costs started to pick pace five years ago and during the last three months of 2017, the costs were 27 per cent higher than in 2012. The PHCPI is based on housebuilders' costs in constructing a standard house; the index is adjusted for changes in specification and reflects only the movement in the underlying direct costs to the housebuilders. In the long-term, the housebuilders’ costs negatively impact the house prices, leading to annual inflation. The RICS conducted a survey last year and 75 per cent of the contributors reported increases in costs. While 30 per cent of them indicated that labour costs had risen, another 30 per cent reported materials cost increases. Approximately, 40 per cent of them cited increases in both labour and materials. The responding contractors expect their costs to continue to rise during 2018, RICS said. The housebuilders reported the cost increased involved bricklayers, timber and related insulation for timber framed houses, groundworks and scaffolders. There were several mentions of a general skills shortage among the labourers. The PHCPI is based on housebuilders' costs in constructing a standard house; the index is adjusted for changes in specification and reflects only the movement in the underlying direct costs to the housebuilders.